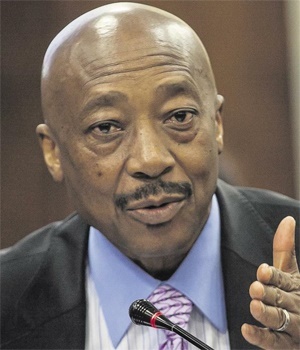 Cape Town - SARS Commissioner Tom Moyane on Monday hit out at what he termed “the blatant misrepresentation of facts” regarding the reappointment of top SARS official Jonas Makwakwa. Makwakwa, chief officer for business and individual taxes at the revenue service, was suspended on September 15 2016 amid investigations regarding financial transactions into his personal bank account that had been red-flagged by the Financial Intelligence Centre (FIC). Makwakwa returned to SARS on November 1 2017, following an almost year-long suspension. “SARS notes with deep concern media reports spreading the allegation that there has been impropriety on the part of Commissioner Tom Moyane in dealing with the disciplinary investigation into Chief Officer: Business & Individual Taxes, Mr Jonas Makwakwa,” the revenue service said in statement on Monday afternoon. SARS it set to brief Parliament's standing committee on finance on is annual financial report on Tuesday. Following Makwakwa's suspension last year, SARS hired law firm Hogan Lovells to investigate the matter. Its report, which was completed in June 2017, has not yet been made public. SARS earlier said a disciplinary hearing based on this investigative report had concluded that Makwakwa was not guilty. As such, he was able to return to his previous post. However, on November 3, two days after Makwakwa returned to SARS, Hogan Lovells published a press release in which it said it had not directly investigated the suspicious financial transactions identified by the FIC. “The scope of the investigation conducted by Hogan Lovells was limited to identifying whether any misconduct had been committed by Makwakwa and [his partner Kelly-Ann] Elskie as employees of SARS,” said Hogan Lovells. “All transactions as per the FIC suspicious report were put to Mr Makwakwa to respond and he did. It was those responses which lead to Hogan Lovells concluding that an act of misconduct could not be found from the transactions and their sources,” it said. The revenue service did not immediately reply to a request for comment to clarify why Hogan Lovells said it had not investigated the financial transactions identified by the FIC. SARS said on Monday that the disciplinary inquiry was “patently fair, unbiased and independent process”. It said the law firm’s report “concluded that there was no prima facie evidence that Mr Makwakwa had committed any misconduct in relation to the financial transactions emanating from the FIC report”. Moyane appointed Advocate Terry Motau, SC, a senior counsel from the Johannesburg Bar, to chair the Makwakwa’s disciplinary inquiry with “the guidance and assistance of Hogan Lovells”. The inquiry concluded on August 15 2017, and Moyane received the non-guilty outcome on October 13. He returned to work just over two weeks later. SARS noted in its release on Monday that Makwakwa is facing a criminal probe with regards to the suspicious transactions, but said this did not fall under the jurisdiction of the commissioner. As Fin24 previously reported, SARS said that while it was not opposed to releasing the FIC and Hogan Lovells reports, doing so might disclose personal information of South African citizens. SARS has written to Yunus Carrim, chair of Parliament's public finances oversight committee, asking him to put together a four-member team that will engage on the legal implications of disclosing the reports. In a media statement earlier this month, Carrim had urged SARS to make the reports public. "Although we have no evidence that Mr Makwakwa and Ms Elskie are guilty of the allegations against them, we still believe that it is in the public interest that the report be released. "Given the role SARS plays, it not only has to be, but be seen to be above reproach, and perceptions of irregularities by its senior officials have to be effectively addressed,” he said in a statement on October 31.